No luck with the dug well—at this point, the standing level has dropped around 10 ft. since spring, and the replenish rate is barely a foot in 24 hours—so it’s on to other water sources and delivery methods. As with most things on this tiny farm, the ultimate fallback tends to be something really labor-intensive. (Hahahahaha. I have to laugh.) In this case: WATER BARRELS. 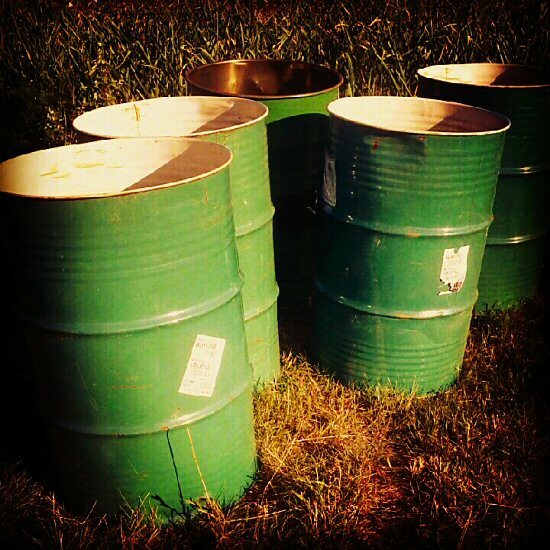 In a thankfully typical seek-and-ye-shall-find situation, there is a supplier of used barrels just down the road. Who’d have thought! These are standard 55 gallon, available in steel or plastic, and only about $10 a pop, with optional lids for a couple bucks more. Of course, they’re food-grade, which means, coated on the inside and used only for food, with those weathered white labels telling the story: pickles, perhaps. Strategically located around newly seeded beds, the barrels are filled from the house well (via the former dead well pipe) and then, 2-gallon watering cans do the final job. We still need rain as things grow, but this will work for germination and seedlings. Whatever it takes!